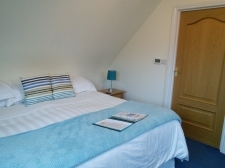 Set in a modern, contemporary house Wadebridge Bed and Breakfast is within easy walking distance of Wadebridge town centre but far enough away to offer a quiet and peaceful stay. Situated in a quiet residential road we have off road parking and can offer secure storage for bikes and surfboards plus garaged parking should you have a treasured vehicle. Our delightful rooms, called Padstow, Polzeath and Rock are clean, bright and spacious and feature comfortable beds with fresh, sumptuous Egyptian cotton linen to ensure a good nights rest. The en suite bathrooms feature powerful and plentiful hot showers, under floor heating and electric towel rails. In your room there is tea and coffee making facilities with fresh milk, flat screen televisions with freeview and DVD and there is free wi-fi in all rooms and throughout the house.